I recently updated my coupon binder categories. Each category has a different-colored page. If I run out of pages in a section, I just make a new one with the correct colored page. I put a label on the first page of each section (first produce page says: “Produce”). As I clip coupons, I put them in the next available space in the correct section (flour coupons go in the grocery section = green). Sometimes, I’ll shuffle things around so that similar items (pistachios, pecans, etc.) are next to each other. If there are any coupons that I know I definitely want to use (for an item currently on my grocery list), I put a sticky tap on the side of the page to catch my attention. If there are any coupons expiring during the week, I move them to the pocket at the front of the binder. I ask family, neighbors, and coworkers for coupons that they don’t want, so that I can have multiples of the same coupons. That way, when an item is on sale, I can stock up. My coupon binder is in my car next to my reusable shopping bags. Here’s a link to my posts on making a coupon binder. Janet from Cul-de-Sac-Chic made an awesome coupon binder. She made tons of pages in fabulous colors and categorized everything. Wow! 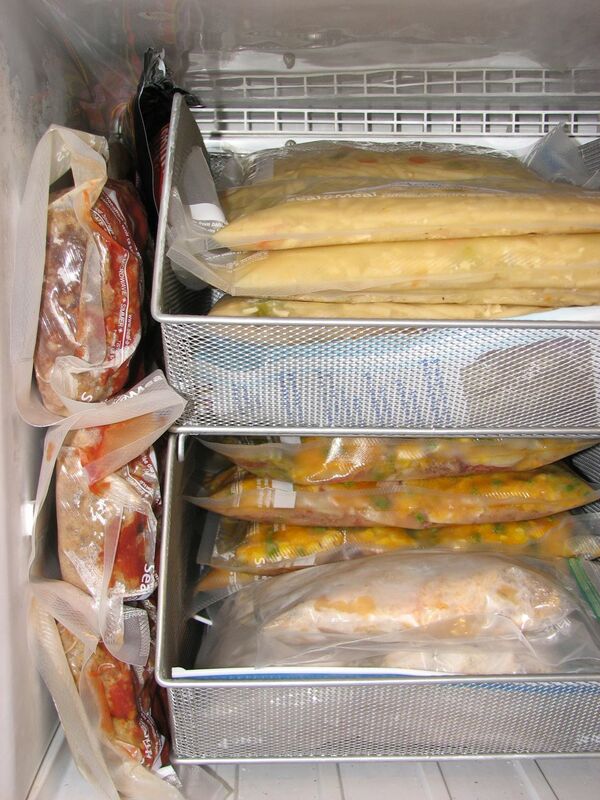 I’ve been using The Food Storage Network to help me plan, acquire, and use food storage. They have great advice, books, posts, and downloadable spreadsheets to help you out. This weekend, since I’ve finally gotten my homework under control (for the present), I’m going to do some massive couponing, studying of grocery ads, and grocery shopping to help build up our food storage. My goal is to get about 1 month’s worth of food over the next month or so, and then build it up to enough food for 3 months. If it’s a coupon I’ll use (and it hasn’t expired), I’ll add it to my coupon spreadsheet, which lists the coupons I have and where they’re filed. If a coupon flyer has no coupons that I will ever use, I’ll toss it in the recycling bin. After I’ve gone through my coupons, I’ll go through this week’s store flyers for local grocery stores and pharmacies. I’ll write down prices for items that I need for my food storage, and then make a list of things to shop for at each store, along with the coupons that I’ll need. I have coupon organizers that I’ve made from sheet protectors. If there are any coupons that I’ll need at the store, I’ll consult my coupon spreadsheet for their locations, cut them out, staple multiples (of the same coupon) together, and place each coupon (or coupon set) in the pockets of my coupon organizers sheet protectors. I’ll take the sheet protectors (not the binder, it’s too bulky) to the store with me and be able to see my coupons easily. I’ve been reading Beating the High Cost of Eating by B. Salsbury. It’s a great “course” on marketing and advertising. I’m learning a lot about how grocers and food companies work to convince you to (1) buy their products, (2) spend more than you planned to at grocery stores, (3) stick with one grocery store, etc. It’s a great book! Every now and then, my coupons do work well, but I’ve found that I’ve put a lot of tiresome work into couponing. (1) I will continue to gladly accept any coupons my coworkers and neighbors offer me. (2) Instead of putting every possible coupon I might need into my spreadsheet, I will only list the ones for name brand items that I absolutely have to have, instead of going the cheaper route for house brands. For example, I really like Ken’s dressing. So, if I see a coupon for Ken’s dressing, I’ll type it into my spreadsheet. The next time I need dressing or Ken’s goes on sale, I’ll stock up with my coupons. On the other hand, I won’t type up whatever name brand cream cheese, because my local grocery has a house brand that’s much cheaper. (3) I will attempt to purchase more house brands, if they are the better price. I’ve learned that coupons (don’t laugh, I’ve been learning…) convince you to buy certain brands, which often cost more, and they also work to get you to have brand loyalty. The cost to make the coupons, do commercials, and other advertising helps raise the cost of name brand products. (4) I’ll still keep all of the coupons, so that if any incredible deal comes along on a name brand, and coupons would really help it along, I’ll search through my coupons for that particular coupon. Well, we’ll see how this goes! Remember that chocolate cake I made the other day? The one where I stacked two (single-layer) slices on top of each other to make a bigger slice? Keep in mind that it was a new recipe, and it wasn’t from a healthy foods cookbook. It used a lot of sugar. After sitting down to eat my slice of cake, I soon found out that this tasty cake was actually too sweet for me to eat a large amount. I knew if I did, I would be facing extreme sugar overload. Wow. 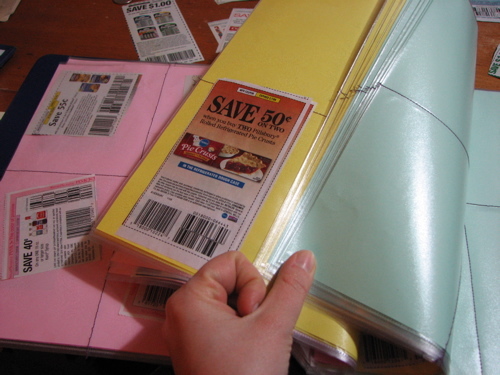 How Do I Keep My Multiple Copies of Cut-Out Coupons Organized at the Store? 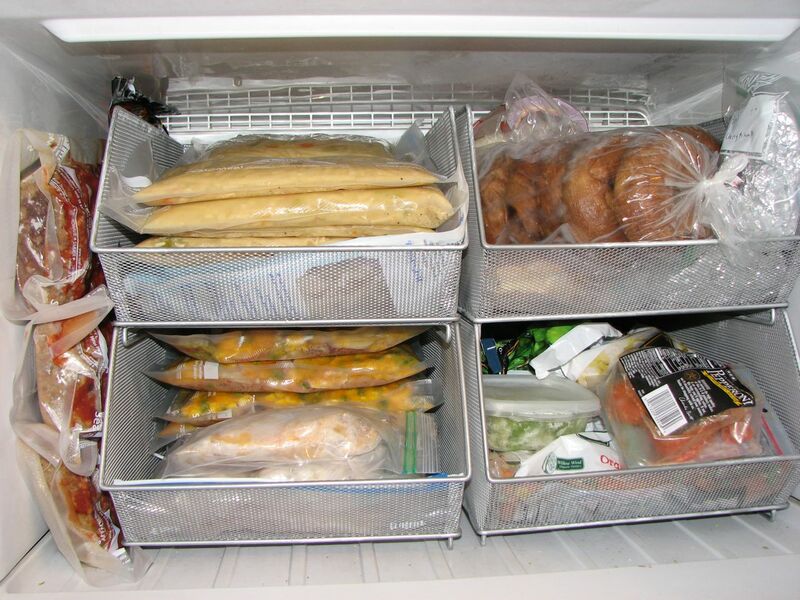 As I’ve said in previous posts, I’ve discovered The Fun with Food Storage Network. One of the sites that links to this is The Obsessive Shopper. They mention acquiring mutliple sets of coupons, organizing them by date and type (Smart Source, etc. ), and keeping a spreadsheet list of coupons you’re interested in (instead of cutting them all out at once). When you’re ready to buy something on sale at the store (or just need to buy something), you check your spreadsheet to see if you have a coupon. If so, you cut out your multiple copies, put them in a sheet protector with your shopping list, and head out to the store. I tried that and had my hands full of coupons. I was constantly shuffling through them. It was not fun. My solution: STAPLE MULTIPLE COPIES OF COUPONS TOGETHER!!!! If I have 4 Pillsbury coupons for the same product, I staple them together, with the earliest expiration dates on top. When I get to the register at the store, I tear off the number of coupons that I need. Back at home, I put my unused coupons in my homemade coupon binder.